I was silly shy as a teenager, so I found quiet ways to express myself using my hands. I didn't start drawing until I was older, but I wrote tons of letters to pen pals. Since I spent a lot of time looking at my hands while writing, I embellished my fingers with shiny rings and pretty polish. Over the years, I've continued to get compliments on my long fingernails, but I've painted them less and less often. Ogre is sensitive to the smell, so I try to squeeze time into my schedule to paint when I won't be around him for several hours. I hadn't thought to try scent-free nail wraps until fellow FAE Kimberly asked me to help her host a giveaway for a sheet of Jamberry Nails. She sent me monster nail wrap samples before it started and they weren't scary to apply at all! All I did was cut a Qtip in half to hold the wrap while I heated it with a hair dryer for five seconds, pressed it to clean nail, trimmed and reheated for another five seconds. And just that easily, my new nail art obsession was sealed! I picked out the pirate nail wraps above as my first full set, but there are way too many more designs on my wish list to stop the pillaging there. That's why I'm hosting a Jamberry party! 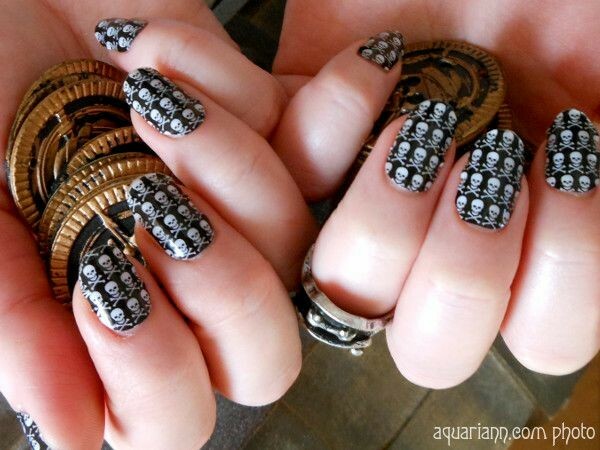 If you want to commandeer skull and crossbones nail art for yourself, please sail through her Kiss My Tips shop and find "Aquariann" in party list during checkout so I get credit toward hostess rewards. Each sheet is $15 and includes enough wraps for at least two full manicures. Jamberry is currently offering a buy 3, get 1 free deal so now's the time to stock up on delightful designs, especially the ones that are retiring this month. I'm starting a weekly Manicure Monday linky this March to spread the nail art love. 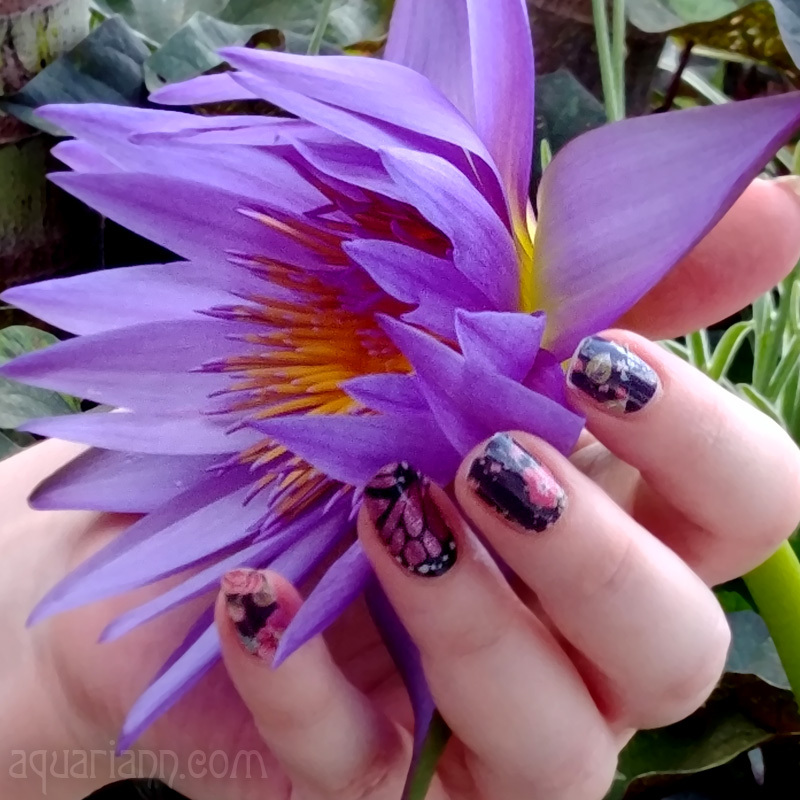 Jamberry nail shields usually last about two weeks on finger nails (four for toe nails), so I welcome guest bloggers to post photos and nail tutorials on the weeks that I don't have new nails of my own to share. Please contact me using the form on my advertise page if you're interested in a free feature. Disclaimer: I received this free nail art as a thank you gift for hosting a giveaway. 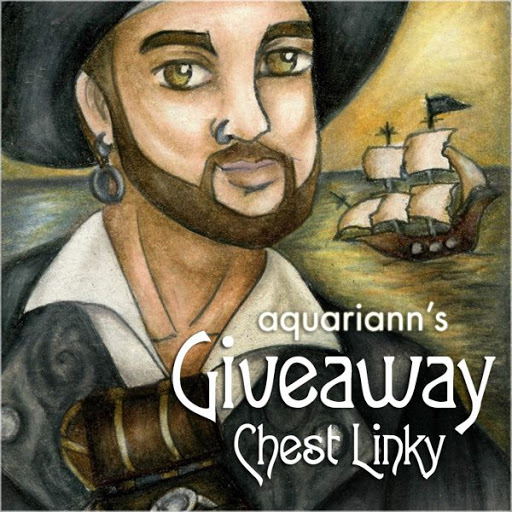 If you think your nail products would harmonize with my whimsical ramblings, learn how to sponsor a giveaway here. These are one of my favorite designs while looking through the website. My son's love of all things pirate hasn't left the family...We're all huge fans! Love this pic. So fun! I should've had these for my trip to the Oregon coast last year. I love, love, LOVE them!!!!! Those nails are adorable! I've never heard of Jamberry before. Interesting. Have a terrific Tuesday! very cute! my sis gave me something similar but I haven't tried them out yet..
Aye! Them be jolly lookin' nails. oooh sooo cute...love it! I rarely use nail art, tho'..as I'm afraid I will easily ruin it with my works :)..love to see your pics..
You do have nice, long nails. Mine are so fragile. There are times when they do better than others. During the winter months are the worse for trying to grow them out. Do nail wraps stay longer on than regular nail polish? How well do they protect the nails? I'm curious to learn more, as this may be something I might consider trying. Happy WW! Thank you! The monster samples I put on my toenails lasted longer than the polish I painted on the same day - I finally had to remove them at 4 weeks because my nails had grown long enough that the bare bottoms looked funny. I've only had the wraps on my fingernails for a week, but so far, so good. If I'd painted them black instead, they'd be noticeably chipped by now! Very cool! Love the nail wraps! Your nails are ahoy matey. How fun. THey make having fun nails so easy these days!! Good job mate!! Nails sure do have a lot of style these days! Love the pirates!